For Moon Bounce Rentals, Tent Rentals, Water Slide Rentals, And Movie Nights in Bristow, VA, Bull Run Premier Events Is The Place To Be! Delivery To Bristow, Gainesville, Manassas, And More! Moon Bounce Rentals, Water Slide Rentals, Tent Rentals, & More! Bull Run Premier Events Has The Party Rentals in Bristow That You're Looking For! If you're in or around Bristow, VA, and looking to plan the perfect party, you've come to the right place! Bull Run Premier Events has all the party rentals you need to make your next special event a smash hit. From the area's best selection of moon bounce rentals, water slides for rent, tent rentals, grill rentals, and giant movie screens for movie nights, to concessions including popcorn, cotton candy, and hot dog machines, we have everything to make your party a success. Planning your back yard birthday parties has never been easier. We have a great selection of bounce houses for birthday parties. From the fun castle, to the party palace, we have what you need to have a great birthday party. Maybe you're planning a large neighborhood event, and planning on inviting the whole block. Why not make it a movie night? 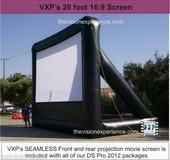 Our 20 foot Movie Screen Rental is perfect for movie nights. Invite the whole neighborhood, sit back and relax. For school and church events, you can't go wrong with our interactive games. From the rock slide, the 40 foot obstacle couse, to the Demolition Ball, we have the large games your guests will flock to. These larger rental items always draw a big crowd and are great for your fundraisers. What party wouldn't be complete without a trackless train? Our cow train is perfect for everything from carting your patrons back and forth from the parking lot, to providng an attraction in and of itself! Of course, summer is almost here. You know what that means, right? Water slides! Our Wild Rapids water slide rental is one of our most popular summer rental items. Kids love spending hours slipping and sliding on this incredible water slide. In fact, we bet they'll have so much fun that they won't want to get off by the time the party is over! Unlike many local party rental companies, Bull Run Premier is so much more than inflatable moon bounce rentals. We also have tent rentals for just about any event. Our 20 x 30 tent rental is perfect for weddings, corporate events, or just about any other event that needs shade. Of couse, what wedding wouldn't be complete without a great dance floor? Bull Run Premier Events rents everything you need to plan the perfect occasion. We even have giant grills for rent. Provide your guests with shade, then feed them delicious barbeque right off the grill! Whether you're planning a beautiful wedding, a backyard birthday party, or any other special event, Bull Run Premier Events has the party rentals you're looking for. We are located in Bristow, Virginia, and proudly deliver all of our party rentals to Bristow, Gainesville, Manassas, Haymarket, Nokesville, Catlett, Warrenton, Centreville, South Riding, Chantilly, Linton Hall, and other local areas. Take a look around and we're confident you'll find exactly what you need to have a great party. With our online reservation system you can order online anytime. Of course, we're happy to answer any questions you might have, so don't hesitate to call us at (703) 785-3840. Thank you for choosing Bull Run Premier Events. We look forward to working with you!